What's The Best Platform To Target Young Adults On? Trying to understand how young adults see the world, especially if you’re in business, is a task akin to quantum physics. We’re an erratic and fickle bunch, pulled in one direction one second, and then dragged somewhere else the next. Our tastes evolve at a pace that’s not quite as rapid as that of our younger counterparts, not immediately impressed by the new fad just because it’s in the spotlight, but nevertheless aware that it’s out there and ready to be swayed if the mood is right. One thing that has remained a constant with we Gen Y-ers though is that we love mobile. We’re just a little obsessed with being able to organise our lives through a device we can take with us wherever we go. And that’s not just me talking; the stats back up this proposition. 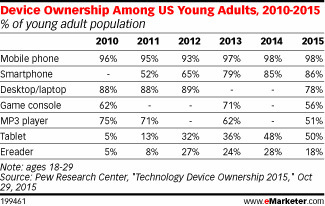 Young adults are more likely to own a smartphone (or mobile) than a desktop or a laptop. While ownership of game consoles, desktops, laptops, and even MP3 players among young people has been consistently on the decline since 2010, according to a survey by the PEW Research Center (available via eMarketer,) the percentage of smartphone owners among young adults has grown from 52% in 2011 to 86% in 2015. In the US, 68% of adults aged 18 and over own a smartphone. Similarly, the amount of tablet users is also on the rise, and has been since 2010. In 2010, the amount of young American adults who owned a tablet was a measly 5%—this number grew to 50% by 2015. There are some obvious reasons for this, of course, tablets haven’t been around for all that long. The first gen iPad, released in 2010, was not when you’d technically call the tablet’s first release. The first smartphone technically came to be twenty years ago. Nevertheless, it is a decent benchmark that reflects the tablet—a powerful piece of technology almost as capable as a laptop or desktop computer—as the tablet we’ve now come to know and love. Seeing as though the tablet is "practically speaking" such a new invention, and that its true capability is only being revealed gradually in incremental bites, that it is slowly becoming more popular among young adults seems only reasonable. The same goes for the smartphone. As the smartphone becomes more capable, as it develops into an incredible piece of tech that serves basically every function a laptop does, so too will it become a staple in the young adult’s tech diet. The progression has been a most natural one. What this means for marketers and businesses is rather simple: if you want to reach us, reach us on our mobile. Indeed, we emphasize this point in many of the articles we write, but the point won’t get old anytime soon. 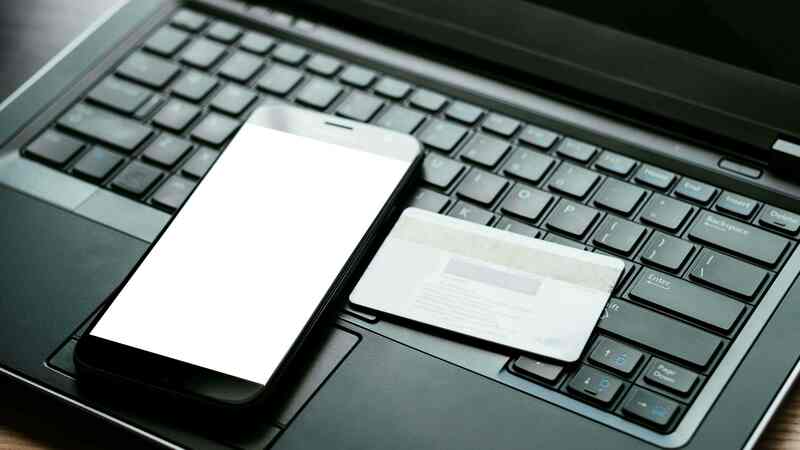 The opportunities businesses now have - especially those whose primary market-base consists of people who fall into the 18–35 age bracket - are endless on their mobile device. You’re dealing with a generation perpetually transfixed by their little glowing screens. We live and breathe mobile, and what’s more, we’re always and actively on the hunt for something worth our attention and time. The trick is trying to figure out what we want when we ourselves often struggle to understand what we want. And though there’s no magical potion any business can drink to gain that information, what businesses can do is look at how other organisations are successfully marketing to young adults, and do something similar, or even better. Starbucks is one such example of how mobile marketing can be done extraordinarily well. They understood that young people would pay for their coffees using the Starbucks mobile app, but only if there was a worthwhile reward for doing so. And so they developed a platform that mashed rewards points together with an easy way to top up Starbucks cash, an easy way to pay in store, with games and entertainment and things ultimately designed to keep Starbucks in the forefront of their customers’ minds. 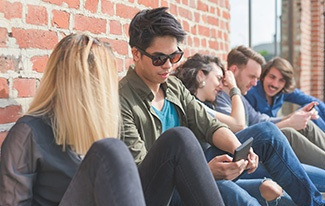 What marketers have by way of we Gen Y-ers then, is an entire group of people who are attached—in the literal and figurative sense—to a little device that’s carried around everywhere. If you want to reach us, mobile is the place to do it. 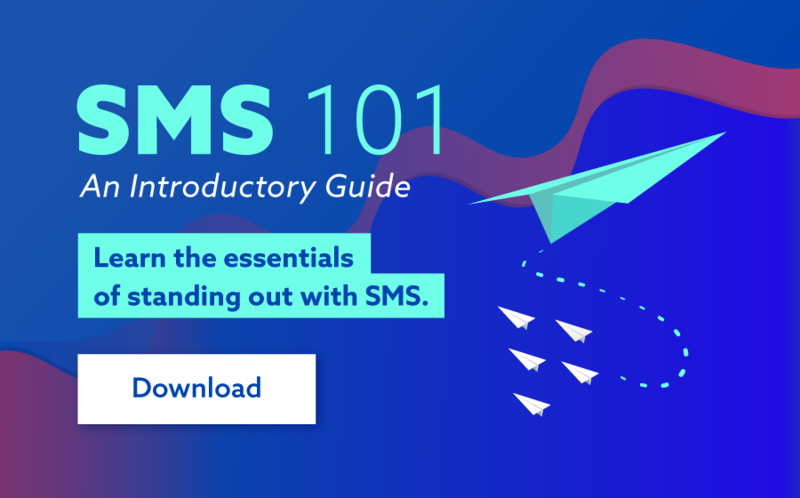 If you'd like to learn more about marketing through a mobile devices or how SMS can help you effectively attract your target market, get in contact with our friendly Customer Care team today for more on how you can benefit with SMS!